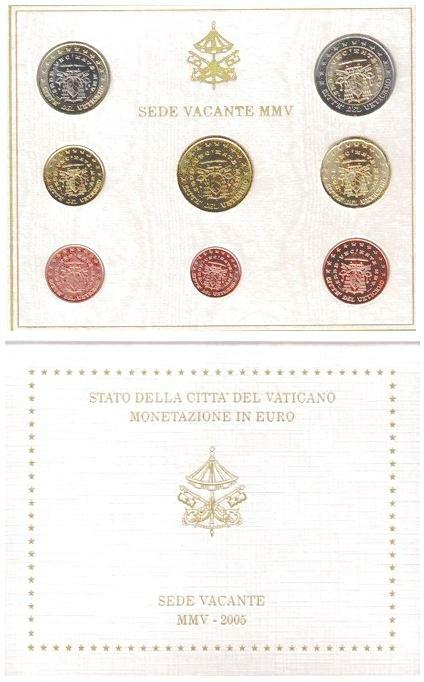 Official Vatican Mint Set of 8 coins issued after the death of John Paul II and before the election of Benedict XVI. First--and last--Sede Vacante set of its type, mirroring the annual sets! In 2008, the Commission of the European Communities issued a not-so-subtle statement: "A temporary vacancy or the provisional occupation of the function of head of state should not give the right to change the national sides of the regular euro coins intended for circulation." Brilliant Uncirculated condition in original folder.